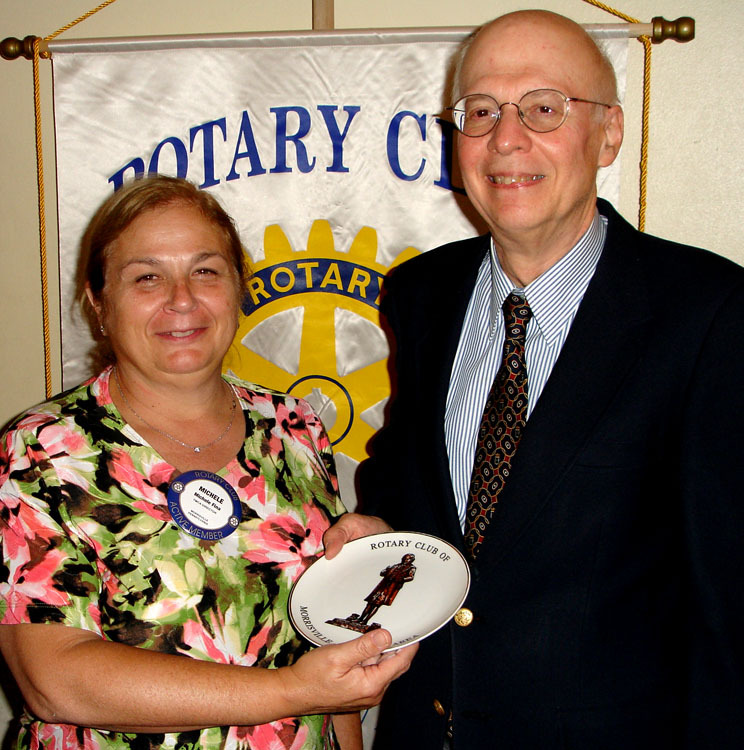 This is the second Rotaryite of President Michele Fina's term (July 1, 2012 - June 30, 2013) and a lot has happened since the first one in September. I have heard commments that the club isn't doing much these days but take a look and see if you think that is an accurate point of view. I think not! You can never judge a gift by its wrappings. You will never know God's great gift until you open your heart to Him. "The Lord will give you grace and glory; no good thing will He withhold from those who wallk uprightly." Becoming a Paul Harris Fellow is an honor bestowed by Rotary to recognize financial support of The Rotary Foundation and dedicated service to others. 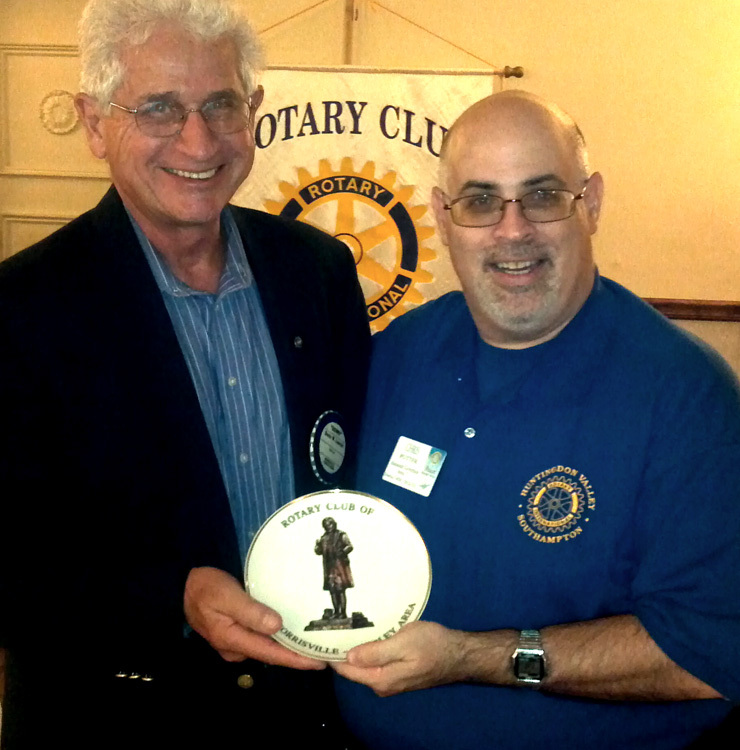 Sam Snipes and Jimmy McNally are the most recent recipients so honored by the Morrisville-Yardley Area Rotary Club. Many people in the area know of tremendous contributions and positive influence Samuel Snipes, Esq. and his family have had in the community over many years. 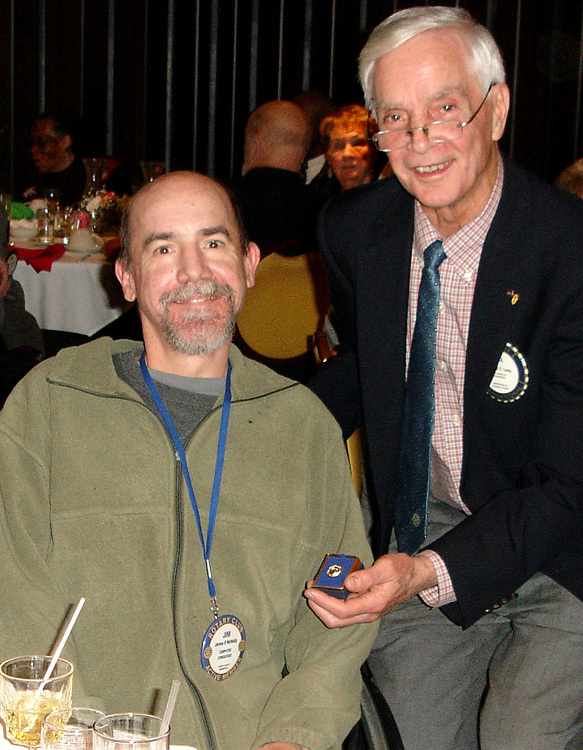 At the club meeting of January 3, 2013, Sam (left) was presented the award by Rotarians Tom Miller (center) and Juan Proano, Club Foundation Chairman. Jimmy McNally (left), son of Dr. James McNally who practiced dentistry in Morrisville for many years and was a dedicated Rotarian, inherited his father's commitment to helping others and is a Past President of the club. Jimmy lives out of the area and battles Muscular Dystrophy but he is a role model for those less fortunate through his courage and good spirit. 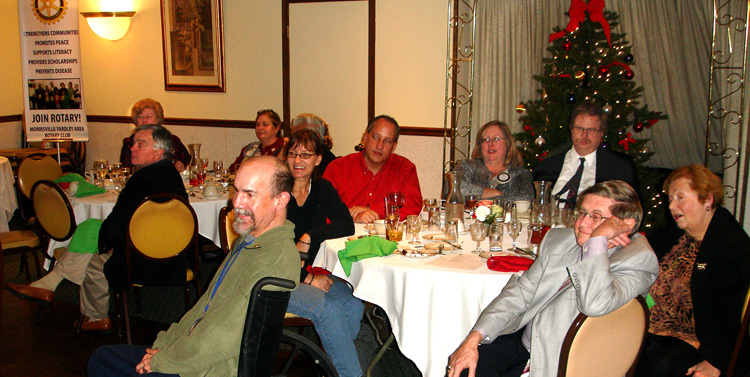 The award was presented at the club's Christmas Party on December 20, 2012, by Rotarian Hal Long. The club has continued helping the Trenton Area Soup Kitchen by serving meals monthly. Rotarian Tom Mack leads this effort. The club also helped Rotarian and Pastor Catherine Bowers of the Morrisville United Methodist Church in the church's "Potato Drop" that provided free potatoes to individuals and to local organizations serving the needy. The club continues with its own international service project in the Lima, Peru. In partnership with the Sunrise Rotary Club of Lima, water filters are being provided to people who lack access to safe water supplies. This project was conceived and is led by our own Rotarian from Peru, Juan Proano. The current round of funding involves a $15,000 matching grant from the Rotary District 7430 and the financial support of other Rotary clubs in the district. Here are a few pics from the most recent distribution of the water filters. Contact Juan at 215-321-2180 or jlproarc@comcast.net if you would like more information or would like to help. 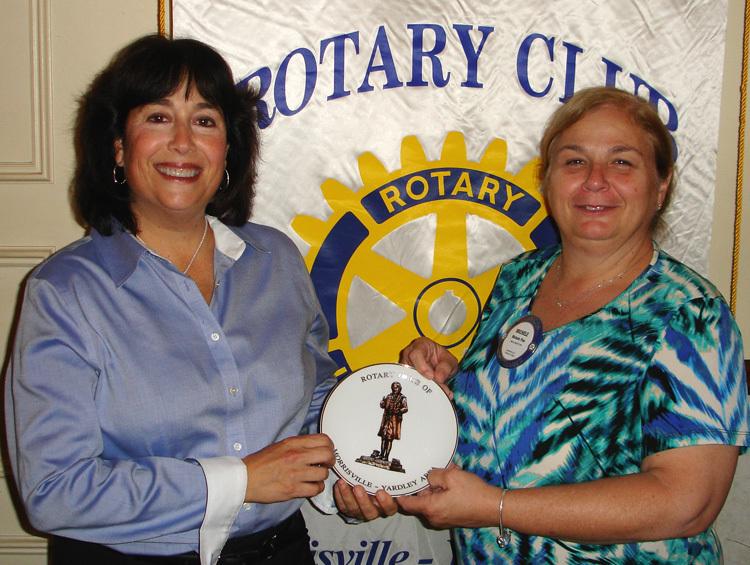 Locally the club is beginning with plans, led by Rotarian Melanie Douty-Snipes, for an educational garden experience at the Morrisville Grandview School that will also beautify the grounds which have been left bare by the removal of the temporary classrooms. The club also is partnering with the Friends of the Delaware Canal and the Landmark Towns initiative, with support from the mayors of Yardley & Morrisville and anticipated support of the boroughs and business associations, to provide better information to canal towpath users about the business services and points of interest in Yardley and Morrisville. This effort is being led by Rotarian Hal Long. The club continues to support Superintendent Bill Ferrara with his Youth Leadership Academy (a version of Rotary's Interact Club) at the Morrisville High School and supports the participation of high school students at Camp Neidig, a Rotary-sponsored weekend leadership development program. Rotarian Dave Sample leads this effort. Any of these projects that interest you but you are not engaged in, just give a call to Rotarian Claude Magnani at 215-547-3363 or at bennym1231@comcast.net and he will put you in touch with the right people. 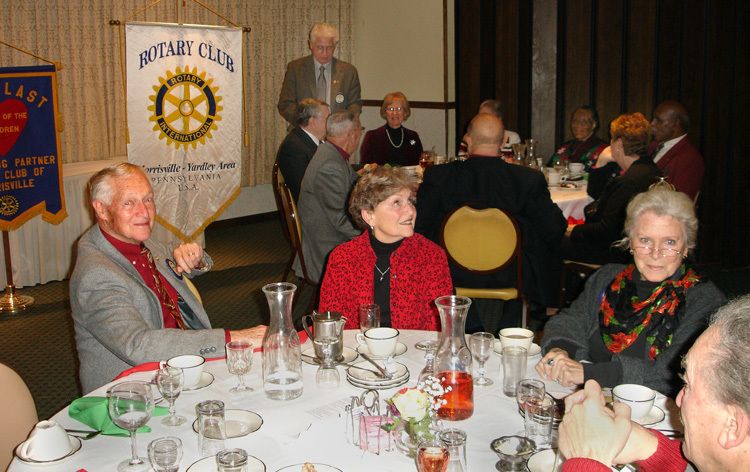 To help promote Rotary in the Yardley area, the club shared a booth with the Pennsbury Scholarship Foundation and handed out notices about the (then) upcoming Gourmet Breakfast. This provided opportunity to talk with a considerable number of people, as you can see Rotarian Axel Augspach (our avid cyclist from Argentina) and Rotarian Linda Yonkin were doing. The club is dedicated to providing financial support to local organizations like the YMCA and Snipes Farm and Education Center, for its own international water filter project in Lima, Peru, and to support The Rotary Foundation which serves world-wide and is leading the charge to eradicate polio from the face of the earth. It also financially supports ShelterBox, a Rotary based project that provides emergency shelter when disaster hits in any part of the world and Rotaplast which provides free corrective surgeries to people in remote areas of the world. 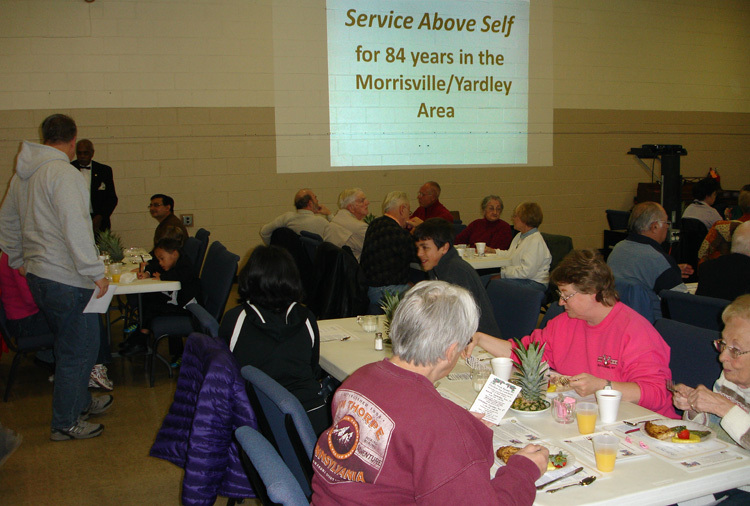 Its fundraisers, such as the Gourmet Breakfast and the Morrisville Carnival, are combined with individual contributions of its members to support these and other local, regional and international service efforts. Please mark your calendars: The next Gourmet Breakfast, at the Morrisville United Methodist Church, is scheduled for May 18. The next Morrisville Carnival will be the second weekend in May. Rotarian Ted Fletcher leads the local fundraising efforts. Here are some pics of the October 13, 2012, Gourmet Breakfast. All work and no play...? No, the members and their families and friends like to get together for fun and they all enjoyed their recent Christmas and Valentine's Day parties. 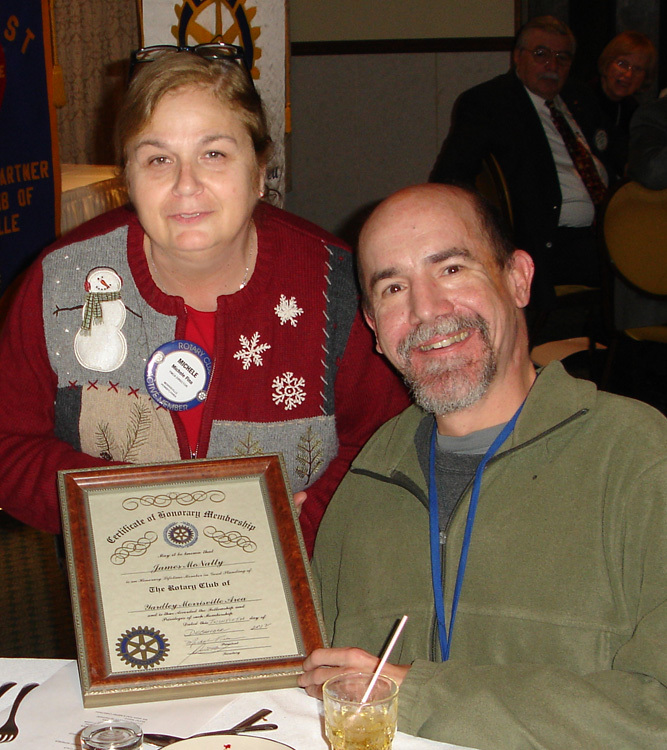 Here are some pics from the Christmas party, including the ones showing Jimmy McNally receiving his Honor Member certificate and his Paul Harris award. Paul Harris, the founder of Rotary, was first interested in just meeting with other business and professional persons to learn what they did and to enjoy their company. That is the basis for the tradition of having a speaker from the community at the weekly meetings. Thanks to the club's energetic Program Chairman, Rotarian Andy Thompson, over the past several months the club has heard from the following. Take a read even if you were at the meetings. There is a lot of good information about these people, their professions and the organizations and programs they represent. 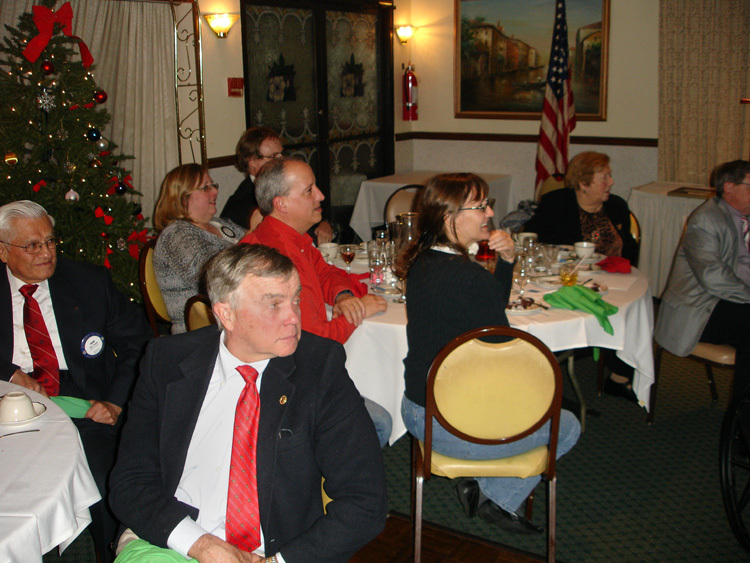 It should be noted that, in additon to the dinner speakers, the club is treated at each meeting by Peter Wisnosky with his Rotary Moment and by Andy Thompson with his Historic Moment. 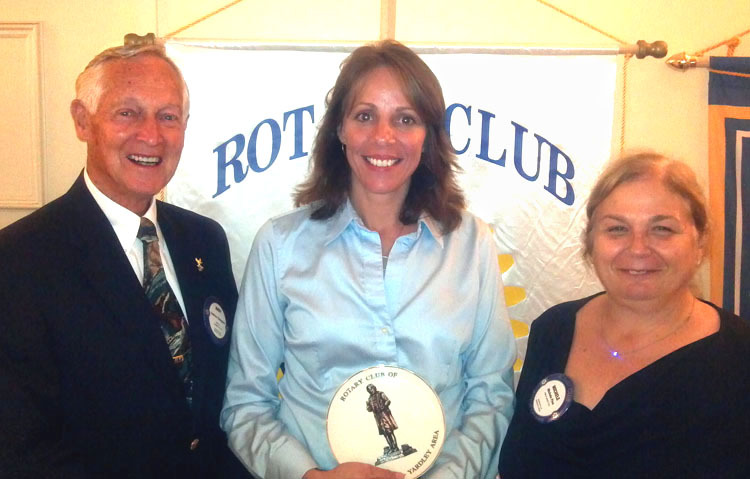 Both are always interesting and informative by these experienced and very knowledgeable Rotarians. Ronald Stockham, a local attorney and grandson of the late Thomas B. Stockham (here with President Michele Fina), gave a fascinating account of the life and impact of his grandfather who, among his many accomplishments, was a state representative and borough mayor and very influential in local and state politics, saved Morrisville from the 1955 flood by insisting the levee be raised five feet when originally constructed, saved the Morrisville Bank at the beginning of the Great Depression, attracted the U.S. Steel Fairless Works to the area, saved Summerseat from destruction, was instrumental in getting the Municipal Water Filtration Plant built, designed the Stockham Building in 1911 using the then state-of-the-art poured concrete and steel construction (thus making demolition very costly and hindering current efforts to repurpose the site), was the driving force behind much of the land development in Morrisville in the first half of the 20th Century and was the first president of the Morrisville Rotary Club. Donna Boone Shubert, Regional Main Street Coordinator of Landmark Towns (here with Speaker Chair Andy Thompson and President Michele Fina), explained that Landmark Towns is part of a larger effort all along the canal up to Easton, and associated with other regional trail systems, to breathe new economic life into Bristol, Morrisville, New Hope and Yardley, through promotion of tourism associated with the canal. Businesses in the Landmark communities can benefit significantly by increased use of the canal trail as people get off to shop, eat and stay overnight. Laura Jones, Corporate Recruitment & Development Manager for Big Brothers Big Sisters of Bucks County, talked about the mission, success and the need for more volunteers, particularly men. The organization was started in 1974 by a county clerk who noticed that most kids involved in petty crimes just need a mentor. The agency's mission is to help children reach their potential through one-to-one relationships with mentors that have a measurable impact on youth. She played a video that noted how much more the volunteers get back than they give and how important the work is to the children who often are from blended and broken families. The needy children typically are identified by a teacher or one's own parent. Relationships are well monitored and independent studies show that by effective mentoring the children perform better in school, avoid violence and illegal activities and have stronger relationships with their parents and others. Funding of the agency is through grants and donations. The Bucks County organization has been recognized by the United Way as the top Agency of the Year for four years in a row. More information can found at http://www.bbbsbc.org/. Darletta Berry-Johnson, Director of the Ivins Outreach Center and Director of the 21stCentury Community Learning Center project, talked about the good news that Morrisville has qualified for a new 21st CCLC Grant that provides $1.5 million over a three year period. It will provide $500 thousand each fiscal year starting June 1, 2012. This will support many additional services and after-school programs she said. J. Richard Norton, owner of Eastern Armored Services headquartered in Trenton, NJ, talked about starting the armored car services in 1992 and the challenges he has faced over the years. He said he is most grateful of not having any major problems during that time. Eastern Armored Services, Inc. has strived, he said, to become an elite provider in the armored transportation industry with its armed courier transport, same day credit, cash / coin processing, vaulting services, customer security consulting, and more. He said its reputation speaks for itself, from its excellent customer service to its new fleet and personable staff. His motto, he said, is "Right on the Money." More information can be found at www.easternarmored.com/. Chris Potter (again! with President Michele Fina)), Assistant Governor for Area 7 and a member of the Huntington Valley Rotary, explained how The Rotary Foundation is funded and how it disburses the money. Guidelines involving Global Grants such as what is needed for the club's own Lima, Peru, water filter project, have changed. The minimum grant for Global projects is now $30,000 compared with the past minimum of $10,000 and there are requirements about sustainability. The district will match what is raised by the clubs, so for the water filter project our club will need to raise $15,000. Rotarian Juan Proano, Chairman of the project, said that the district has said it will support it and at least three other clubs in the district also have said they will support it, so he is confident that the money will be raised. Chris reviewed the various types and levels of donor giving, including EREY (Every Rotarian Every Year - any amount), Sustaining Paul Harris ($100 per year), Paul Harris Fellow ($1000), Paul Harris Society ($1000 annually) and other categories such as Major Donor ($10,000 cash). The funds are directed to the Annual Fund (used in 3 years), the Restricted Fund (used, for example, for PolioPlus) and the Permanent Fund (from which only interest is used). The money is disbursed in two ways. One is the World Fund (distributed through Foundation Matching Grants) and the other is the District Designated Fund (DDF). The DDF comes from 50% of the Annual Fund donations that are distributed after three years and is administered by each district based on the contributions from the district clubs and members and others associated with the district. To make giving easier, Rotary has developed a Rotary Direct program that can be accessed online. Just go to www.rotary.org/contribute. Lois Taylor and her husband, Minister Gary Taylor of the Morrisville Baptist Church, decided to home school four of their five children. One was born with Down syndrome and a hole in his heart and requires support that Lois could not provide at home. The others are well known in the area because they played high school sports at Morrisville. A son was a senior in college, on his way to becoming an electrical engineer, when he had a severe heart attack that resulted in brain damage and left him incapacitated. The oldest graduated from college with degrees in communications and Bible. Home schooling was chosen primarily so they could teach values without the peer influence that is common, particularly in the early grades of 3rd through 5th. Also, home schooling allowed them to address the specific needs of each child. Lois said she has Bachelor Degrees in Bible and in social work and that figuring out the curriculum was not a problem. There are many resources available. She noted that there are reasonable state education and testing requirements and evaluations intended to assure that the children receive good educations. Tom Taylor, U.S. Navy (retired), talked about the POW/MIA history from WWII through Korea, Vietnam, Dessert Storm, Iraq and up to today. There continues to be a strong effort to find and recover the remains of those military personnel lost in in the various wars and military campaigns but Tom noted that while there are over 73,000 still unaccounted for from WWII there are less than 1400 unaccounted for from the Vietnam conflict. There are a little over 6500 unaccounted for from the Korean conflict but about 5500 of these are in are in North Korea where recovery has been greatly hampered by the North Korea government. Harold Mitchener, a well-known Bristol historian, talked about the early days in Bristol, the businesses and the demographic makeup of the population. He also cited the friendly sports rivalry with Morrisville. He described Bristol's link to Burlington Island which was the site of an amusement park, built in 1917 and destroyed by fire in 1934. Bristol's St. James Episcopal Church was founded in 1712 and its cemetery is the resting place of Revolutionary soldiers and other luminaries from Bristol's past. Ferries transported passengers between Bristol and Burlington until the Burlington-Bristol Bridge opened in 1931. In 1922, Bristol annexed Harriman Village north of the borough. Harriman was originally built during World War I to house some 12,000 employees of a shipyard along the Delaware River. The shipyard was owned by millionaire William Averell Harriman. After the war the shipyards closed and there wasn't a need for the workers. The thousands of families now living there had no governing body and many worked in Bristol and were involved socially so becoming part of the borough made sense. Rodney Wagner has Bachelor's Degree in Ornamental Horticulture and is a certified arborist. He explained how he uses his specialized knowledge and experience in organic techniques, rather than relying on the standard chemical sprays and treatments, for diseased trees and unhealthy shrubs that the homeowner and business owner want to save. The company he founded can be reached through its website http://www.plantpreservation.com/. Jim Rea, a financial advisor at Crossgate Wealth Advisors in Yardley, talked about the somewhat surprising positive returns on various market sector investments in 2012. He also went over some of the key provisions of the American Taxpayer Relief Act that was signed into law January 2, 2013, after a last minute deal by Congress to avert the so-called fiscal cliff. He provided a handout showing both the new tax brackets for 2013 and the old 2012 brackets for comparison. Jim can be reached at 215-860-2234. John Warenda, Esq. - Executive Director of the Morrisville Municipal Authority noted that in Pompeii there were lead pipe, fresh water supply systems with canisters of activated charcoal. He pointed out that the source of today's water supply is the Delaware River which is much cleaner than it was in the 1960s and early 70s as a result of EPA regulations and enforcement. Unfortunately the entire infrastructure, including the waste water and storm water collection systems, has gotten older as the demands on it have increased due to population growth. Maintenance is a continuing problem but the treatment plant continues to meet all of the clean water and discharge water requirements. 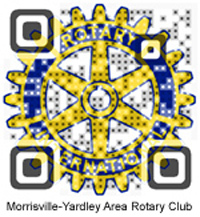 For more information about Rotary and about the club, go to www.myrotarypa.org. You can use the website's QR Code for quick access.